The "Daily Show" and "Colbert Report" have made their contributions to the ever-growing canon of "Harlem Shake" remix videos. The meme began late last month when a group of what appear to be college students dressed in latex suits shot a goofy video of themselves dancing wildly in a cramped dorm room to "Harlem Shake" by Baauer, a Brooklyn-based electronic music producer. The video quickly went viral, amassing more than 5 million views on YouTube. In early February, five Australian skateboarders—including one wearing what appears to be a motorcycle helmet—followed suit. Theirs went viral, too, racking up more than 7 million views and inspiring scores of imitators. By Feb. 11, there were more than 12,000 “Harlem Shake” videos on YouTube, according to ABC, with everything from swim teams to startups joining in on the fun. 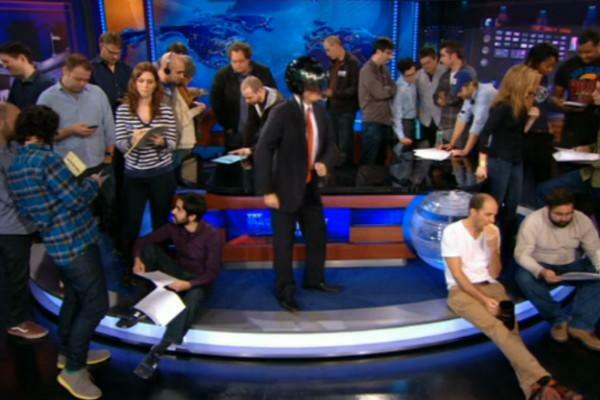 Which brings us to this: Jon Stewart, clad in a helmet and surrounded by the "Daily Show" staff, dancing to the bass-thumping track. In the "Daily Show" version, Stewart is ditched by the staff and ends up dancing in a cape alone. Not to be outdone, Stephen Colbert led a "Harlem Shake" remix with members of the "Colbert Report" studio audience.